PARIS --- The Dutch government on Monday published a new defense white paper it describes as “realistic and future-oriented,” and which promises to increase defense spending by €1.5 billion per year beginning in 2021, after smaller yet significant increases of €1.2 billion next year and €1.4 billion in 2020. However, defense spending will peak at 1.3% of gross domestic product in 2020, before falling back to a structural target of 1.25% in 2022 – still well short of the NATO target of 2% by 2024. 1. The armed forces must remain versatile in terms of deployability, because threats differ greatly in nature and intensity and the security environment is constantly changing. 2. We will first modernise our existing weapon systems. Our adversaries are producing or acquiring increasingly technologically advanced weapons. We must respond to this development, also to keep our people as safe as possible. 3. We will increasingly operate on an information-driven basis with the aid of a solid IT infrastructure. The priorities outlined above result in the investment programme set out in Appendix IV. Again, and however serious the government’s approach, the capability targets set out in the white paper do not appear particularly ambitious nor particularly stretching. The Royal Netherlands Army is tasked with providing “a composite task force of brigade size for a limited period of time,” or a battalion-sized task force for an extended period of time, as well as smaller, specialized units for specific missions. Following the introduction of the Lockheed Martin F-35, the Royal Netherlands Air Force’s deployment goal will be halved. With the F-16s it currently operates, the RNLAF is tasked with providing a group of eight F-16s for a limited period of time, or of four F-16s for an extended period. However, once it converts to the F-35, it will only be expected to provide four F-35s for an extended period of time. In addition, the Air Force will also provide supporting assets such as air-to-air refueling, strategic and tactical air transport, and helicopters to support operations on land and at sea. The targets are even more modest for national security tasks, which the white paper describes as two combat aircraft for Quick Reaction Alert; one MCM vessel for missions in the North Sea; two composite units for port security and a Marine brigade and a Special Security Missions brigade to support the Special Interventions Service. Additional units are planned for support, and two ships and a company of marines to protect the Dutch dependencies in the Caribbean. The white paper also details the main funding goals, although their detailed definition is left to be determined at some future date, notably the annual budget negotiations among the members of the government coalition. A very detailed table on the investment program details the major procurement programs covering the next 15 years. 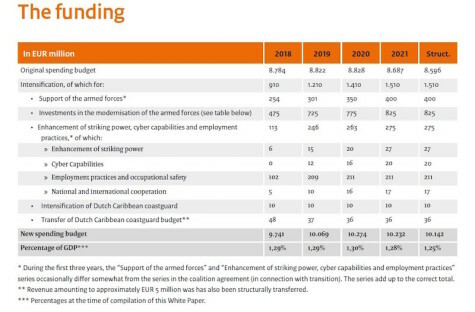 However, before buying new equipment, the Dutch armed forces will invest quite considerable sums to modernize and upgrade most major weapons currently in service. The two most expensive programs identified in the white paper, and whose cost is estimated at over €2.5 billion each, is the replacement of the current submarines and of the air-defense and command frigates. Investments of €1 billion to €2.5 billion is estimated for the replacement of the multipurpose frigates, and up to €1 billion each for the new mine countermeasures vessels and for the acquisition of a combat support ship. Also slated for acquisition are the ESSM Block II missile (up to €1 billion), the replacement of the SM-2 Block IIIA (up to €1 billion), and the replacement of two LPDs, HNLMS Rotterdam and HNLMS Johan de Witt (up to €1 billion each). 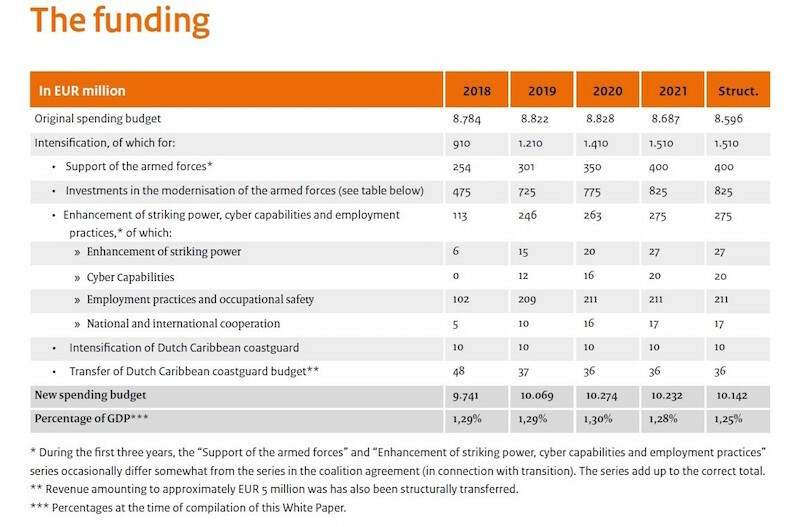 In this respect, it is interesting to note that naval programs will absorb almost €14 billion over the next 15 years, even though the Dutch coastline is relatively small, and its territorial waters protected by NATO allied in all directions. The white paper lists the cost of the Lockheed F-35 fighters being procured as “over €2.5 billion,” which is something of an understatement, with up to another €200 million earmarked for their tactical and strategic air-to-ground weapons, the latter probably being a euphemism for the integration of the B-61-12 nuclear free-fall bomb which in case of need would currently be carried by Dutch F-16s. -- We are working with Belgium to replace the multipurpose frigates. The air defence and command frigates are currently undergoing a modernisation programme. Regarding the replacement of these frigates, a statement of requirements will be issued in a few years. -- We are also working with Belgium to replace the current mine countermeasures capability. We are working on an innovative concept of mother platforms and unmanned mine countermeasures systems. The development of this concept is one of the PESCO projects in which we are participating. -- The current submarines will be replaced by manned submarine capability. A study carried out by the Netherlands Organisation for Applied Scientific Research (TNO) has shown that variants other than manned submarines cannot meet the requirements (and are very expensive). The variants referred to will therefore not be developed further in the DMP B phase. The DMP B letter regarding this matter will be sent this year. -- We will increase the deployability of fighter aircraft and helicopters. * landing transport dock (LPD) and hydrographic survey vessels. * the Chinook (transport helicopter). Furthermore, three Chinooks will be added to the current fleet. -- A small unit is experimenting with unmanned systems in land operations. -- For the F-35, we will purchase systems that counter air-to-air and surface-to-air threats. We will also purchase medium-range and long-range missile systems. -- We will replace the C-130 (transport aircraft), the air to air refueling capability (KDC-10) and the air transport capability (multi-role tanker transport aircraft, or MRTT). The MRTT aircraft will be purchased in partnership with Belgium, Germany, Luxembourg and Norway. It will also be possible to deploy these aircraft for the provision of humanitarian emergency assistance and (medical) evacuations. -- We will press for a more open European defence market with a level playing field. In the case of tendering processes, we will interpret Article 346 of the Treaty of Lisbon (Treaty on the Functioning of the European Union) broadly and thereby take the security interests of the Netherlands into account. -- With regard to procurement, we will operate on the principles of “fast, unless” and “off the shelf, unless”. This will of course apply to proven technology. -- We will update the defence industry strategy this year. The strategy will explain how, in cooperation with the Ministry of Economic Affairs and Climate Policy, we will stimulate innovation in the context of the Top Sectors policy and provide a foundation for strengthening cooperation with the business community. -- Certain Defence sites throughout the country that had previously been earmarked for closure will be maintained. Click here for the white paper (28 PDF pages) on the Dutch MoD website.